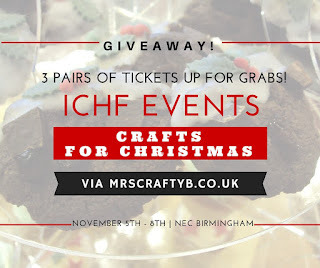 Mrs Crafty B: GIVEAWAY: 3 Pairs of Tickets for ICHF's Crafts for Christmas! What are you waiting for?! This is your very last chance to win free entry for you and a friend. This competition ends on Tuesday 27th October so get entering now and be sure not to miss out! Will YOU be one of three #CraftyBs selected to join in the crafty Christmas fun?